I would like to wish all my readers a "Very Happy and Prosperous Diwali". Have a safe Diwali and enjoy yourselves. Diwali is a Hindu festival of lights celebrated in a very traditional style in most homes. 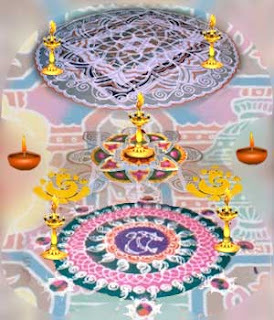 It is the time of the year when one cleans up the house in preparation for Diwali and decorates it with lights, diyas and colorful Rangoli patterns inside and outside the house. 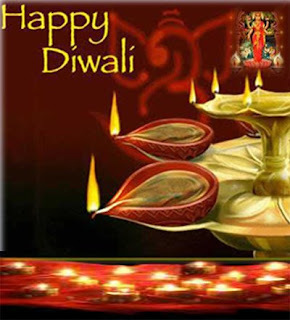 Diwali is celebrated with a lot of fun and fanfare in every household in India. It can be compared to the Christmas celebrations elsewhere. There are lots of gifts bought for the household members and also new items for the home just before Diwali on Dhanteras. People buy gold, silver or any other metallic items for the house, which is considered to be auspicious and will welcome the Goddess of wealth "Lakshmi" into the homes. A puja is performed for the Goddess on the day of Diwali ushering in light and wealth into the homes. People exchange sweets and wish each other "A happy Deepavali" wearing new clothes and bursting firecrackers in the night. All the homes look bright and colorful with the lights and diyas and Rangoli welcomes guests into the house. 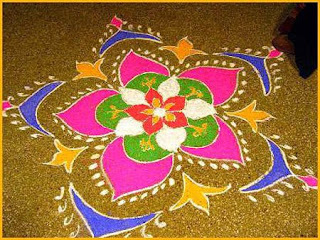 Visit the original article to get links to the sites for free Rangoli patterns and designs to download and also more information on Diwali traditions, wallpapers, recipes, greetings etc..